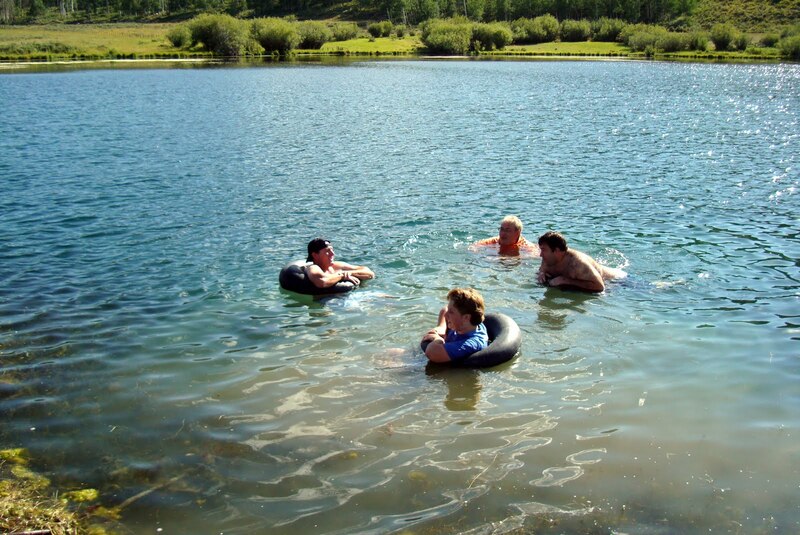 It was another great week at my sister's family ranch (Stewart Crow Creek Ranch) out of Afton, Wyoming. We had a wonderful time with family. The week went so incredibly fast. And now looking at our photos I realize we took way more movies than still photos and we used my daughter Whitney's camera more so I don't have those photos to post. This will be a very quick vaca photo report. The lake is always fun. 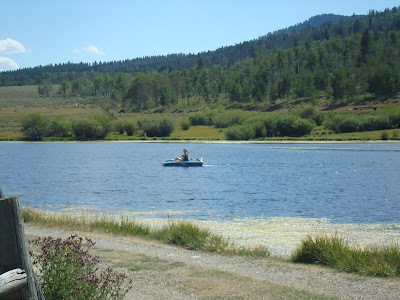 Our family likes to spend time out on the boat, fishing and paddling around in the very very cold water. My nephew Josh, Mason Dave having a "man dip" here in the lake. Dave said it was bonding time. 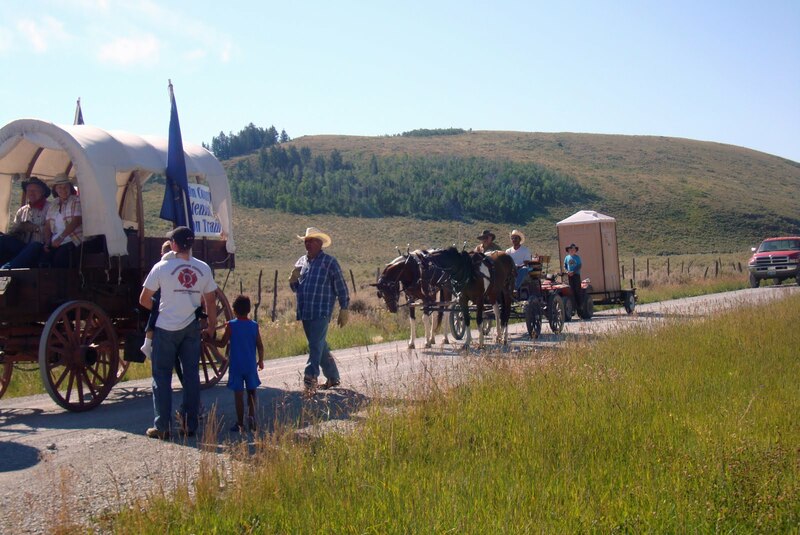 While we were at the ranch, a wagon train came through on the old dirt road that goes from Afton into Montpelier, Idaho commemorating how trade used to travel through those towns. The Stewart ranch is right off that road. The wagon train took kids and adults on rides. 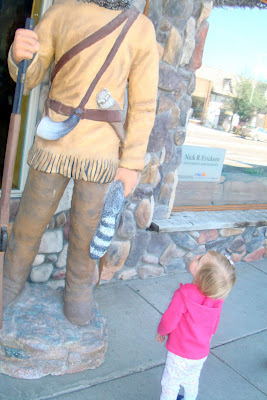 We went into Afton a few days for supplies and lunch. We had fun going down main street with Allison. Shadow is in his bag next to Allison and Shelbie. Shadow is easy to take around and is so good in his bag. No one knows when we go into stores that we have a dog. More main street and Allison. 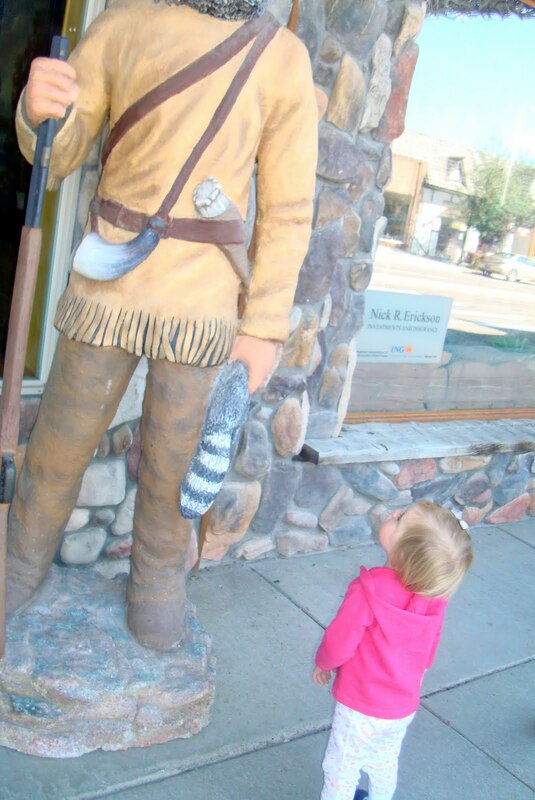 She wasn't sure what that big guy was doing. 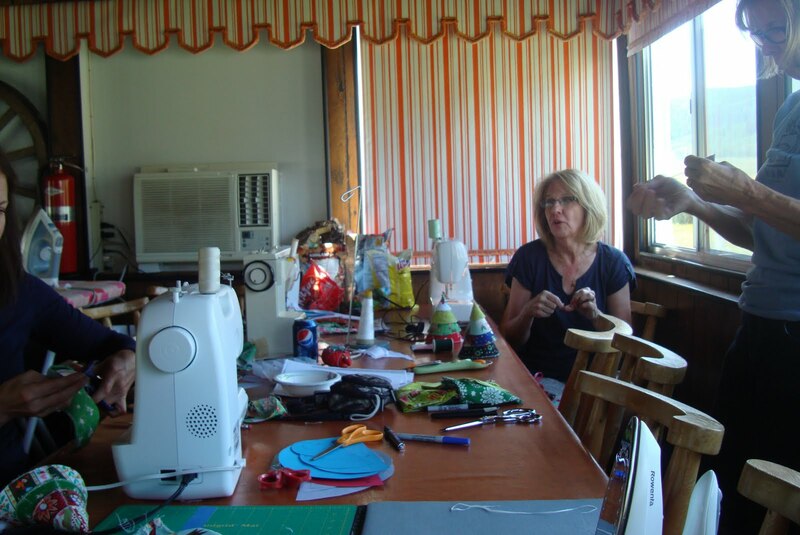 We always do a craft or sewing project. 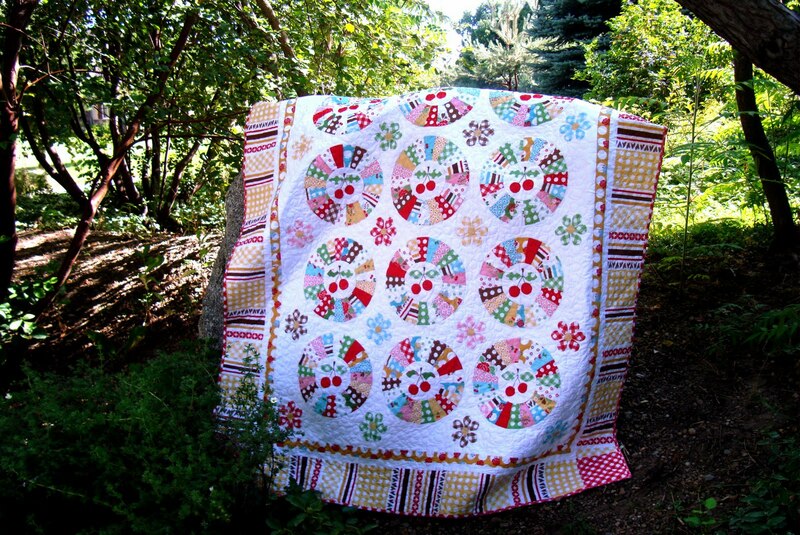 We made Christmas Trees from this pattern. 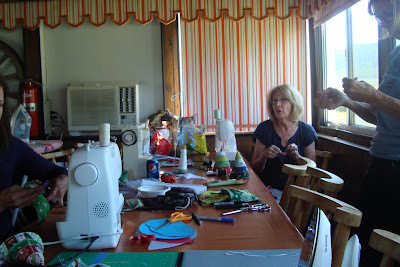 You can just see them sitting next to my sister Polly and her sewing machine. That was really fun. 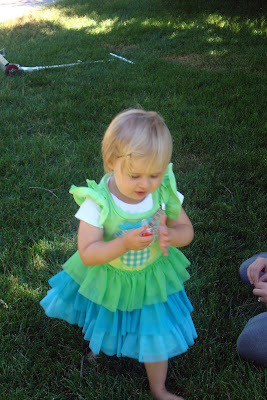 We also had a carnival for the grandchildren but I don't have photos of that (darn!). 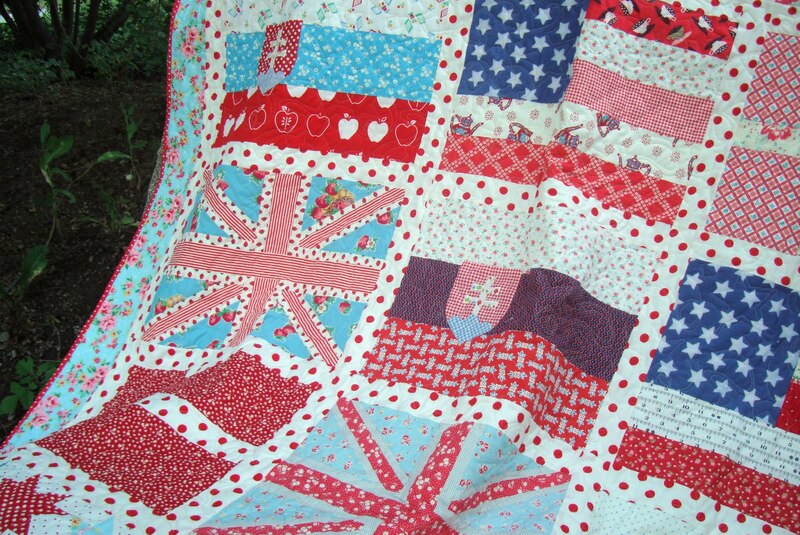 If you remember I made myself a family history quilt from flags of my heritage. I made mini quilts for my sisters with the same flags. 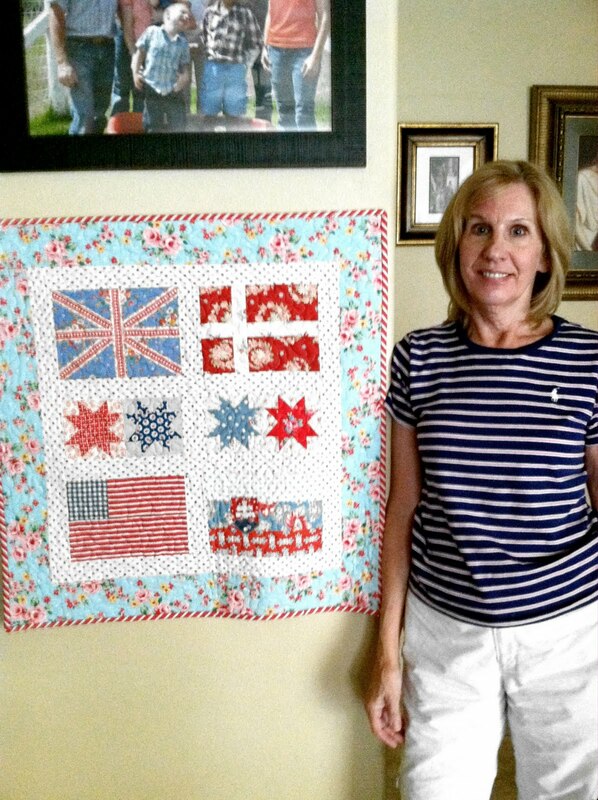 This is my sister Polly standing next to hers after she hung it at her house. So back to life now. And into fall. Tomorrow is September already. I only have Mason at home and in school now. It is kind of weird but life marches on. I'm back people. It is kind of hard to get going again. But I'm working on it. 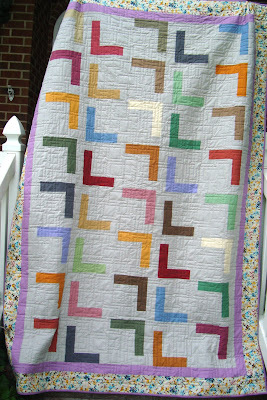 In the mean time, please go to the Riley Blake FaceBook page and vote for my quilt (if you want to). 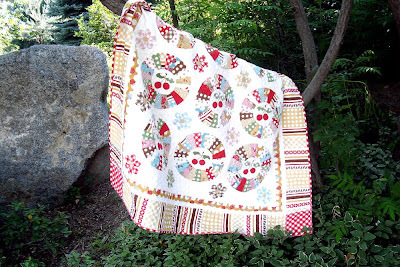 I've entered their contest with my Cherry Cheesecake quilt. If you don't want to vote for me, vote for Robyn. Her's is great. 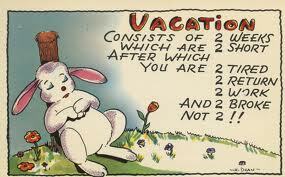 I'm going on a much needed and anticipated vacation. I will be back August 29 (I think). I hope you are all having a nice August. This is a continuation of my project I showed last Friday. I showed you my Asterisk Union Jack made from the tutorial on Selvage blog found here. 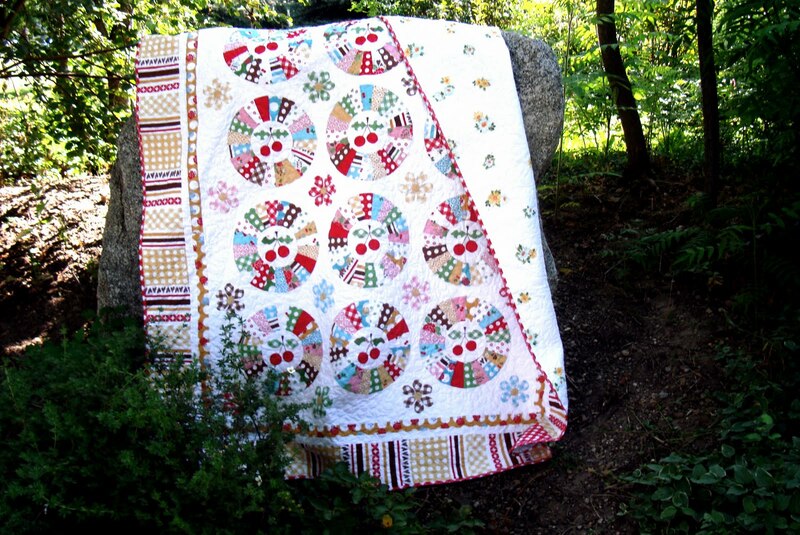 The quilt made by Karen (shown above) was featured in QuiltMaker magazine. Isn't it fabulous. I really love it. I want to make this quilt. In review, I used the tutorial and changed up the size to 6.5"x9" to make the Union Jacks. 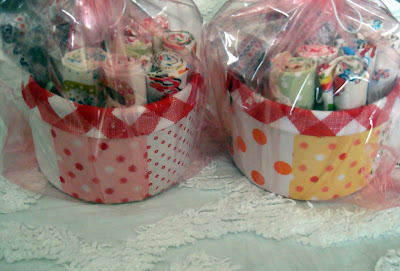 And I made several of them. I'm making a tiny table top version of my personal flag quilt. I made mini Slovakian flags in the same 6.5"x9" size. I actually used fusible for the shield, cross and mountain part of the flag. 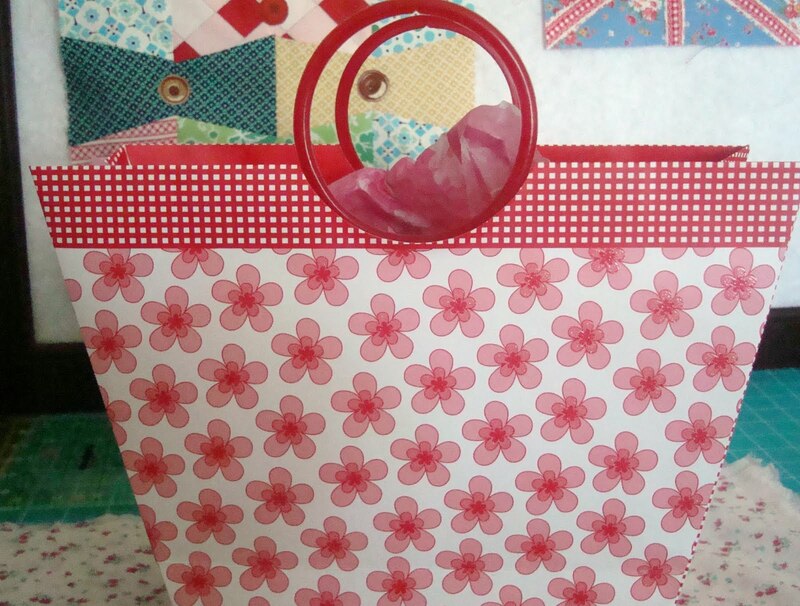 I hardly ever use fusible but for this application it worked perfectly. I made mini Danish flags. 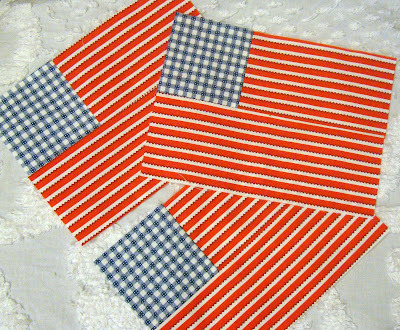 And I made mini USA flags. They all went together fairly quickly. 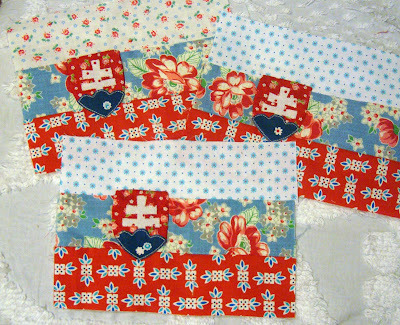 Now I need to sash them, border them and machine quilt into the mini table toppers I have planned. When I saw the covered can project on Farm Chick's blog I really wanted to make some covered cans. Serena used a small coffee can but I'm sure any can would do. I got these new craft cans online a while ago for buttons small bits of this and that, so I decided to try making a few covered cans. 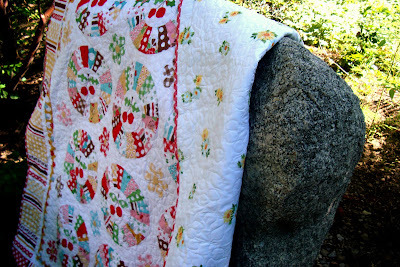 I used Elmer's extra strong spray adhesive that I knew would hold fabric on metal. I used Annie's Farm Stand fabric for the body of the can. 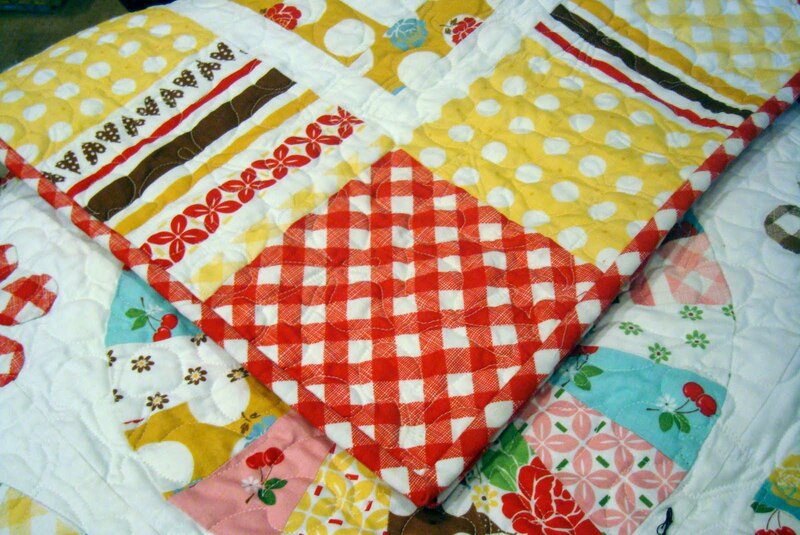 And Lori's Sew Cherry red gingham for the top, folded like a seam binding. Recently I had lunch with Lori and Rae Ann. You know how we always bring treats to share, well I filled the cans with some little fat 16ths, trim and goodies. I think they turned out really sweet. 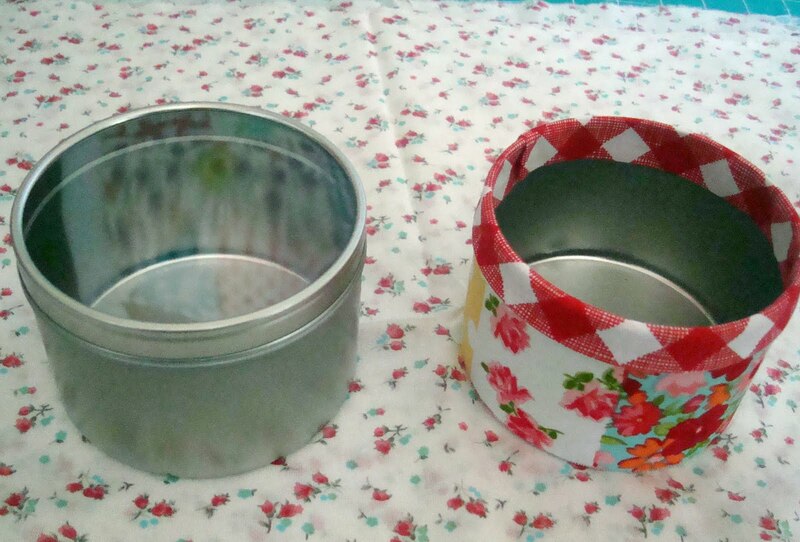 The cans are a great idea for a make-it take-it or a n0 sew craft for friends. Anyone can make these. Rae Ann brought Lori and me a cute box. 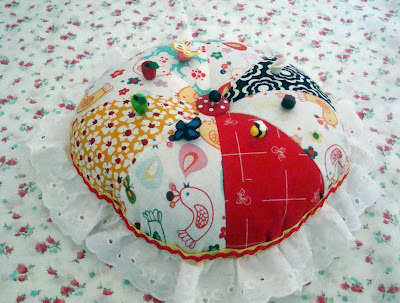 Inside was this big pincushion with home made pins. It is a really sweet Dresden pin design and I love the ruffle. Thanks Rae Ann. 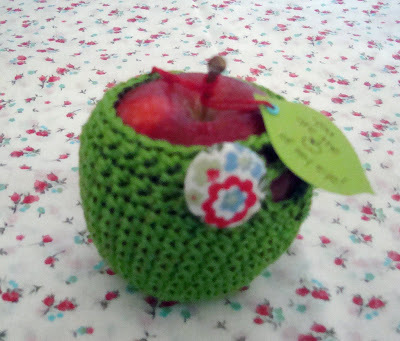 Lori made these really great crochet apple cozies for us. I've never seen anything like it. I love that color with the red apple and the covered button gives it a nice accent. Thanks Lori. 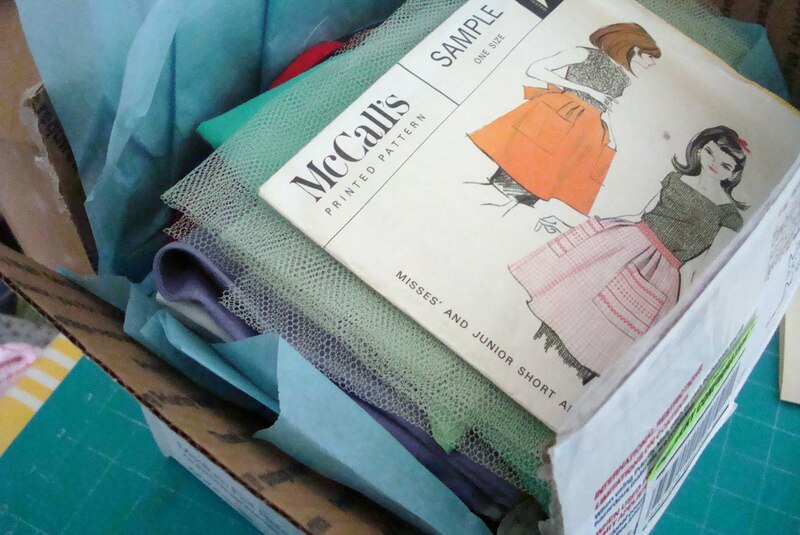 At lunch I brought this box stuffed full of vintage aprons. The box was sent to me by Barbara, a darling blog reader who won a giveaway of market fabric recently and has been a reader of my blog for more than 3 years. It was so nice of her. The aprons are all her mother's aprons. 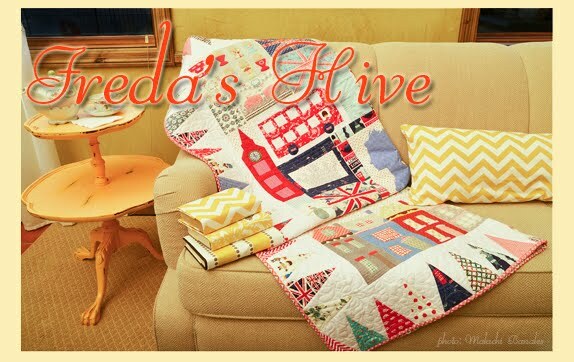 Barbara's mom was the real life June Cleaver and wore aprons everyday (and never wore pants!). Barbara's mom recently passed away and Barbara wanted to share some of the aprons with me, Lori and Rae Ann. Wasn't that so sweet. 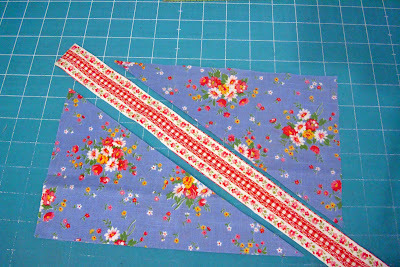 After lunch we oohed and ahhed over all the fabrics and the lovely mix of aprons. 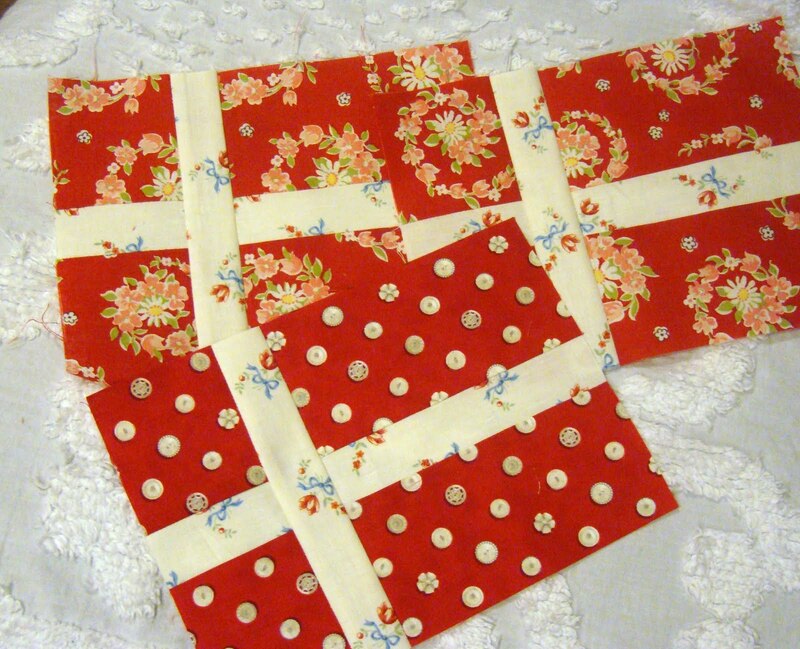 The aprons are keepsakes of the past made with delightful fabrics. 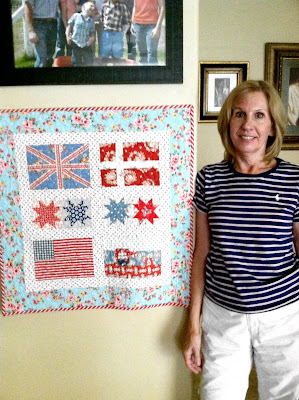 Thank you again, Barbara for thinking of us and sharing with us. 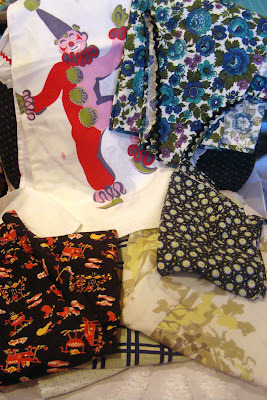 We each got to pick and choose and take some of the vintage aprons home. While I was at lunch I picked out this really cute skirt (on sale) for Allison. 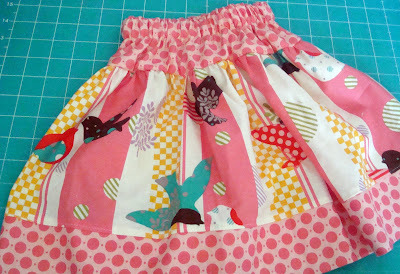 I am sure the fabric cost as much as I paid for this skirt so I couldn't pass it by. It is a little big yet but will be cute on her. Allison spent a few days at our house last week. We had a great time with her. She is obsessed with being outside. I love when she comes. She's growing up so fast. 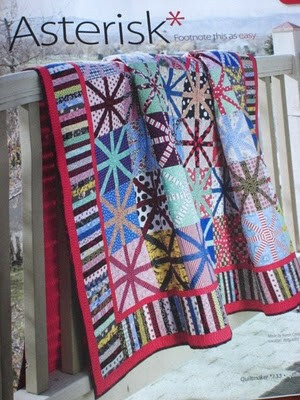 I came across PamKittyMorning's post about her asterisk block here. 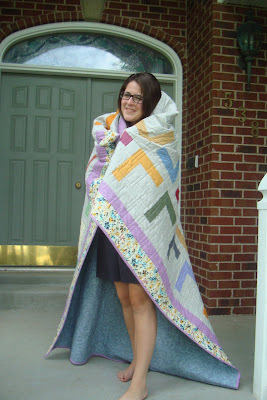 And she referenced a tutorial found here from Selvage Blog. 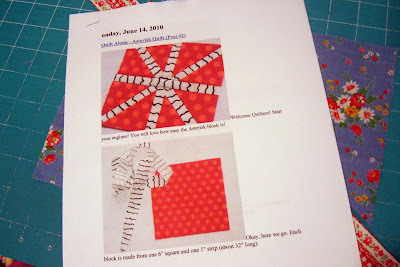 So I printed off the instructions to make the asterisk block and by changing the dimensions and using some of my red and white striped fabric the asterisk became.... ...this very simple fussy cut Union Jack in mini flag block. 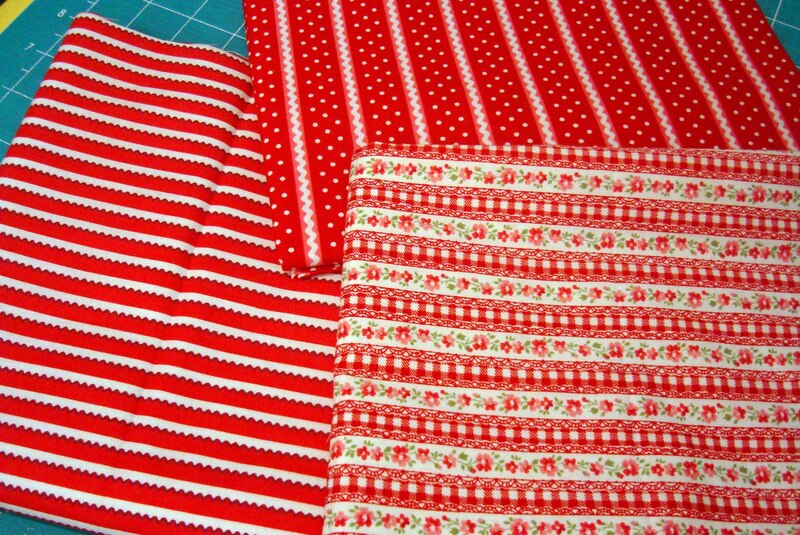 I fussy cut a red and white striped fabric. 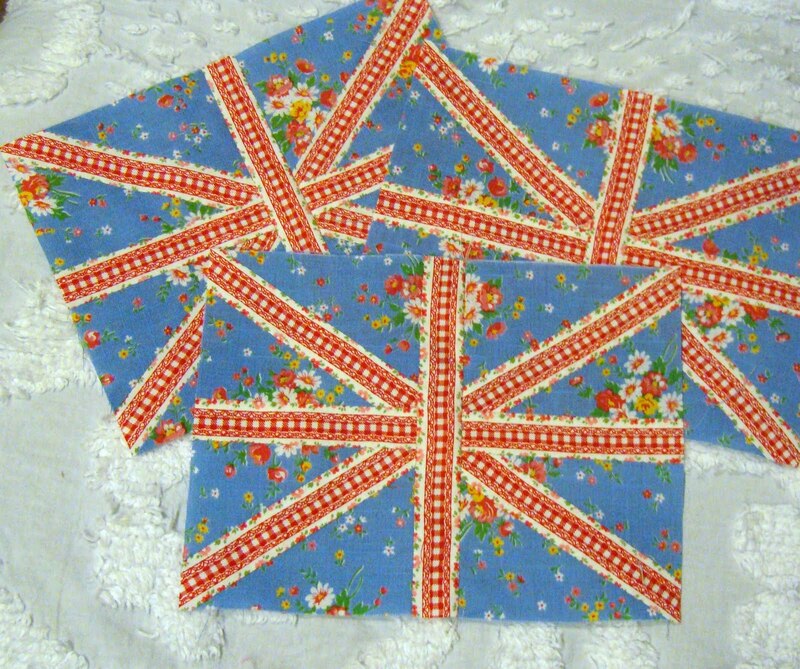 This allowed me to eliminate the step from my original Union Jack block of stitching a white fabric next to a red fabric. The instructions said to cut block 6X6". 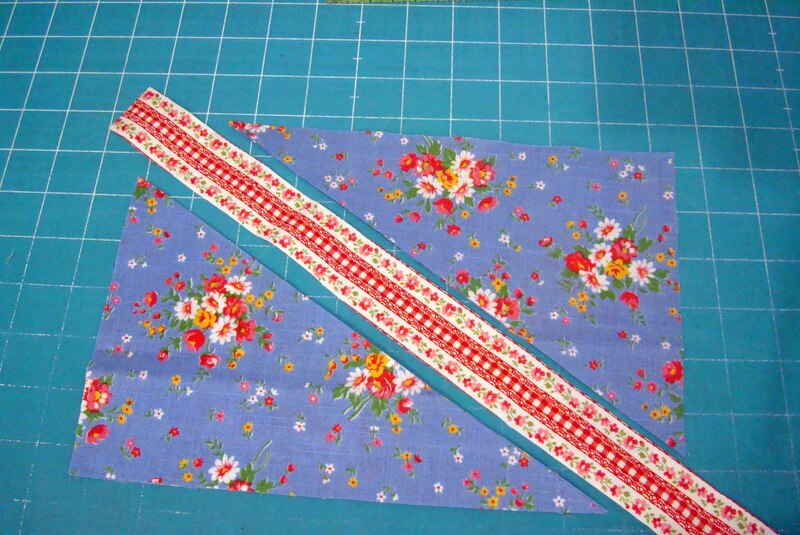 But to make it flag sized I cut the blue fabric 6x9". The intersecting stripe I cut slightly larger than the instructions in the asterisk block stated. 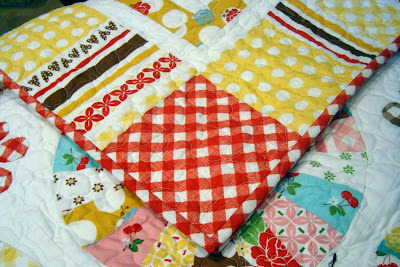 I followed the simple instructions from the tutorial for making the block by cutting and then sewing as it went along. 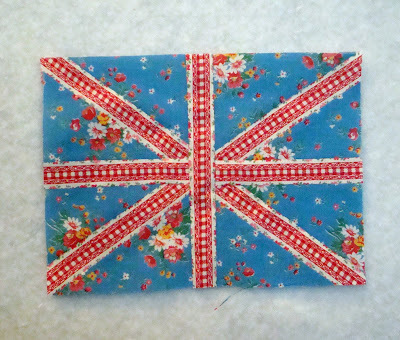 I want to make lots more of these little Union Jacks. Sometimes my stash comes in handy when I can just get an idea, go to my shelves, and make something as inspiration hits. 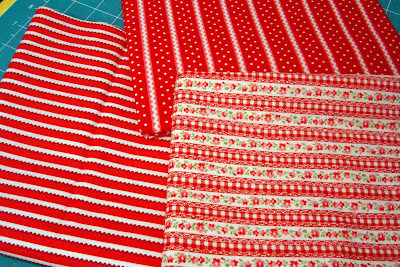 Go red and white fabric! 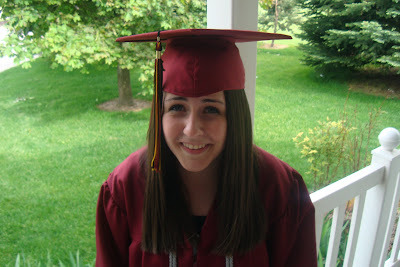 Early in June this year my 7th daughter (and 2nd to youngest) Laurie graduated from high school. With ropes no less (is that what they call those?) Yayy. I know, it is August and I'm finally showing graduation pictures. But there is a reason for this. I love this photo of Laurie mostly because it is one of the only times I've seen her in heels. 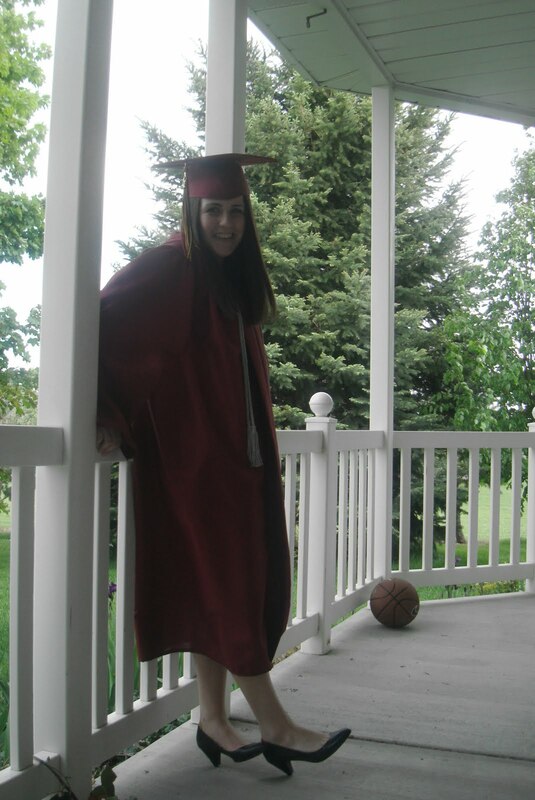 See that basketball in the background? That is much more descriptive of Laurie's personality than those heels. Laurie is one of those great kids that I take no pats on the back for. She pretty much came that way. Laurie keeps the family in line and I'm grateful for that. 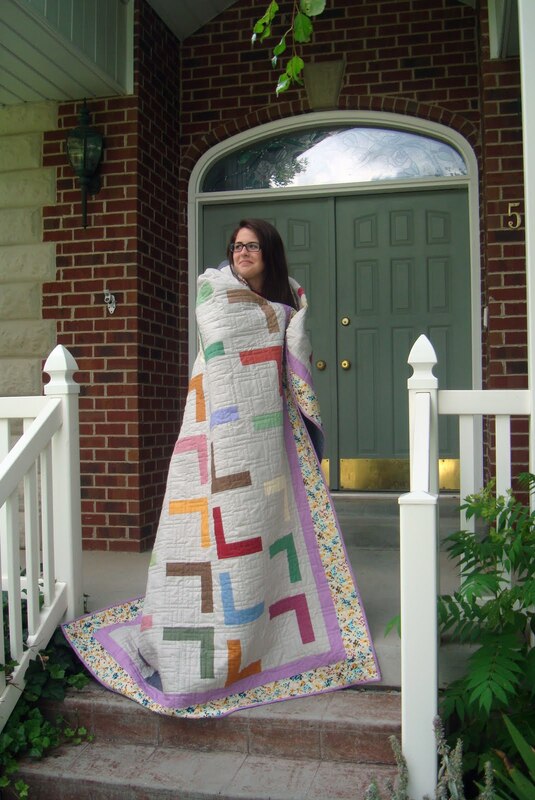 Here is my reason for finally posting her graduation - I finished her graduation/dorm quilt. Obviously Laurie's name was the inspiration for the quilt. The Ls are backwards and forwards and sideways, sorta. The border is kind of Nintendo inspired. See, I can do modern! 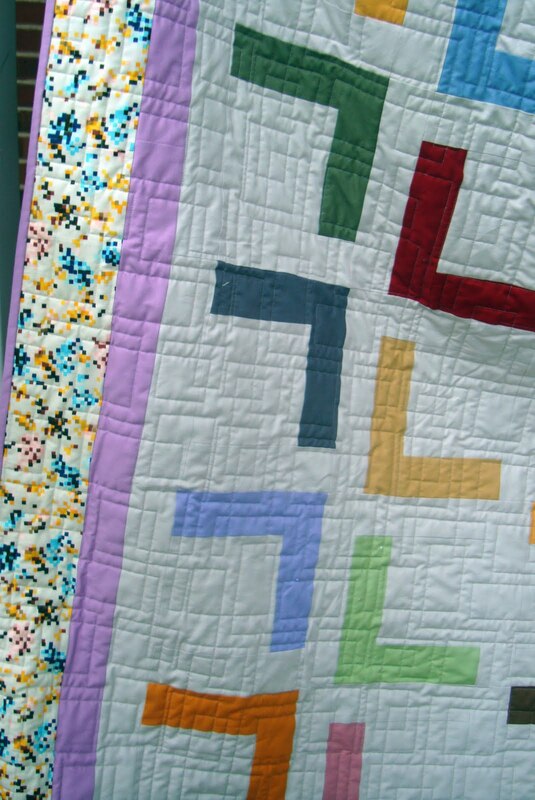 Modern was the biggest stipulation when Laurie told me what she wanted in a dorm quilt. She wanted modern boxy quilting, too. And she likes purple. She could probably be my complete and total opposite in textiles. And sometimes in personality. I certainly didn't earn a full freshman year tuition scholarship from the University of Utah School of Business when I was in college. 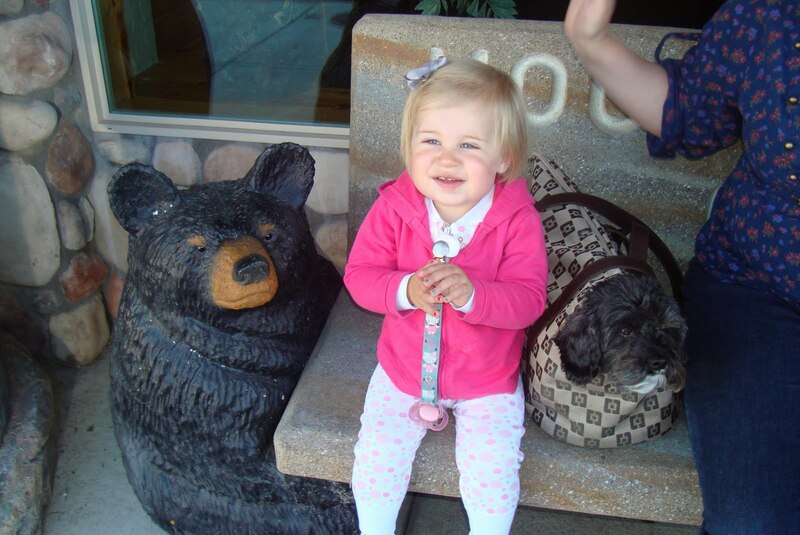 (sorry for the bragging) She starts school in 2 weeks! Yipes. 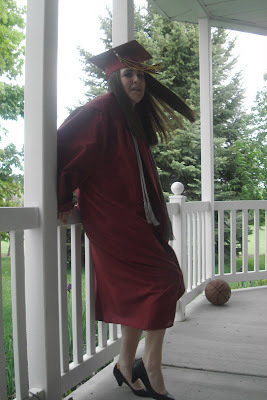 I just get such a kick out of these photos with heels that I had to post another one. It makes me laugh. And see her beautiful hair? She didn't get that thick chestnut hair from my side of the family. But her hair is naturally curly like mine. Can you believe she straightens it? Crazy. I'm really going to miss Laurie, even though she's only going to be 45 min. away.